Forklift sales and hire from Glasgow to Edinburgh, Aberdeen to Dumfries and all of Scotland in between! Access Mechanical are proud to announce that we are now a Dealer Partner in Scotland for Jungheinrich forklifts. Sales from Glasgow to Edinburgh, Aberdeen to Dumfries and all in between! Exclusive sales from Glasgow to Edinburgh, Aberdeen to Dumfries and all in between! World’s first all-wheel-drive multidirection forklift! Leading Scottish dealer. Sales Glasgow to Edinburgh, Aberdeen to Dumfries and all in between! Full range from FORK EXTENSIONS to SNOW PLOUGHS! Sales from Glasgow to Edinburgh, Aberdeen to Dumfries and all in between! Sales across Scotland, from Glasgow to Edinburgh, Aberdeen to Dumfries and all in between! Over 25 years’ collaboration in Scotland! Sales from Glasgow to Edinburgh, Aberdeen to Dumfries and all in between! 20+ years of expert sales across Scotland from Glasgow to Edinburgh, Aberdeen to Dumfries and all in between! Access are Dealer Partners of Jungheinrich forklifts in Scotland. 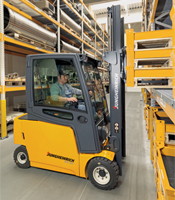 All Jungheinrich fork lift trucks are manufactured to the highest quality standards. We can supply 3 and 4 wheel electric forklifts, gas forklifts, hydrostatic forklifts, powered pallet forklifts, as well as reach trucks, hand pallet trucks and pedestrian powered forklift trucks. From our modern offices and workshop in Bellshill, Lanarkshire, by the M74 and M8, we have easy access for fast service support to clients in Glasgow, Edinburgh, Stirling, Perth, Dundee and Fife, indeed all over Scotland. Access Mechanical Handling Limited are Scottish agents for Hiab Moffett. The Moffett is a truck mounted forklift, that is, it executes all the functions of a conventional forklift truck – carrying loads and loading/offloading vehicles. However, unlike a conventional forklift it is light and compact enough to be carried on the back of a lorry or truck and capable of working in rough terrain. At Access we have successfully installed Moffett truck-mounted forklifts for clients all over Scotland from Glasgow to Edinburgh as well as Hamilton, Dundee, Perth, Ayr, Kilmarnock, Motherwell, Clydebank, Greenock, Paisley, Inverness and Livingston. Access Mechanical Handling are proud to announce that we are now exclusive dealers of Agria rough-terrain forklifts in Scotland. 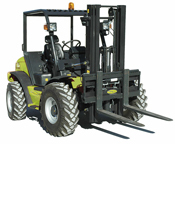 These sturdy forklift trucks boast capacities from 1.6 tons to 3 tons and are all 4-wheel drive. They are manufactured in Western Europe, with Perkins/Deutz engines and Rexroth transmissions. We’re really excited about what these forklifts can do for our customers all over Scotland especially in the Western Isles, Inverness, Ayr and Kilmarnock, Dundee, Fife, Perth, Aberdeen as well as Dumfries and Galloway. Adding a forklift attachment from Access Mechanical Handling can vastly improve the usability of your forklift truck. We can supply forklift attachments for every conceivable use including snow ploughs, battery lifting beams, lifting platforms, drum lifting and drum tilting, jibs, magnets, poles, scoops, skips, sweepers and gritters as well as simple fork extensions. With easy access to the M74 and M8 motorways from our office and workshop in Bellshill, Lanarkshire we are able to offer speedy delivery to clients across Scotland. Combilift is the world’s first IC engine-powered all-wheel-drive multidirectional forklift truck. 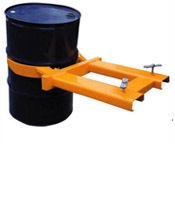 It is actually a combination of forklift and side-loader, and is highly maneouvrable, very safe, very cost effective and supremely efficient. Access are leading distributors of Combilift in Scotland, with clients in Strathclyde, Lothian and Borders, Inverclyde and Grampian. 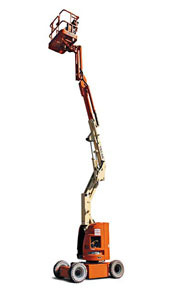 From 10 feet to 150 feet, aerial work platforms from Access Mechanical Handling can get you to the top. We can supply over 50 types of boom lifts, scissor lifts, mast booms, and vertical mast lifts to fit every conceivable personnel lifting requirement, for any company in Scotland. With factory-designed accessories, you will be more efficient and productive than ever. As sole Scottish dealers of Premier Pallet Systems, the world’s leading specialist in pallet-to-pallet transfer equipment, Access Mechanical Handling are able to offer no less than 8 different styles of inverter for all loads and situations. Capable of being loaded by forklift. With Access and Premier our clients throughout Scotland can call on over 50 years combined experience in pallet inverter manufacturing and installation. We have installed pallet inverters all over Glasgow and Strathclyde, Edinburgh, Lothian, Borders and Dumfries. For almost 20 years Access Mechanical Handing have been working with Hymo Scissor Lifts combining to make lifting heavy loads easier. Hymo UK is one of the UK’s leading suppliers with an unrivalled reputation for safety, quality and reliable finished products. The Hymo scissor lifts, also known as lifting tables, come in a variety of capacities from 150 kg up to 2000 kg and are capable of being lifted by a forklift. We have supplied scissor lifts to clients in Aberdeen, Glasgow, Edinburgh, Clydebank, Dundee, Perth and Inverness. Welcome to the website of Access Mechanical Handling, the first choice for forklifts in Scotland. Conveniently situated in Righead Industrial Estate, Bellshill, we have fast and easy access to the M74. For over 25 years now we have been serving the forklift truck industry across the whole of Scotland – from Glasgow to Edinburgh, Dundee to Dumfries, Inverness to Ayr and all in between. So if you’re looking for the best dealer in forklifts Scotland has to offer, then you’re in the right place with Access Mechanical Handling. Give us a call now on 01698 745859 or drop us a line via our contact page and we’ll get in touch with you. Your No. 1 Choice for Forklifts in Scotland!